Toby Unwin, a Florida-based Brit, is the co-founder and Chief Innovation Officer of Premonition. 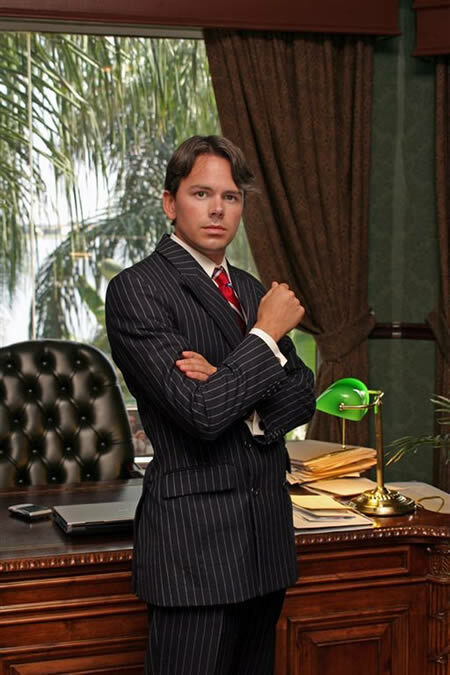 Toby is a fascinating guy who has undertaken a myriad of roles and adventures in his life (for example, he was inaugurated as the Republic of Austria’s Honorary Consul in Orlando in 2006 and once attempted to finish 3 years of law school in 90 days). See Part 1 of our interview here. Toby, what is something you believe that other people think is insane? I believe that many of the things we do in life are based on false or incomplete information. Many of the things that the majority of people accept as “true” are simply because they’re too lazy or scared to question their assumptions. People put milk in tea because they believe it makes it taste better – the actual reason was to prevent the tannins in the tea staining fine china. Milk actually masks the taste of the tea. “Aftershave” is an astrigent, one of the worst things you should put on your skin after shaving. The French failed to sell Eau de Parfum(perfume) in the UK, so watered it down and called it “aftershave”. It was a hit despite being an inferior product to the original and worthless for the purpose it was marketed for. Some of the rules of physics are at odds with established experimental findings. At a higher level it has more to do with religion than hard science. I believe that 98%+ of theoretical physics will be proven to be nonsense. Unfortunately most “experts” in a field get to be there by not questioning the accepted dogma and espousing theories that evolve it in conforming increments. Evolution is easy, revolution is hard. I have many and am a big collector of quotes. At Premonition we have a quote on the wall – “It’s quicker to do it than to talk about it.” (see photo below). A client had asked for a lengthy proposal for a document downloader(which we lacked at the time). I realized it would be quicker to write the program than the proposal, so we just did it. It’s better to act than waste time planning. We’ll likely be wrong in our assumptions, or find difficulties/opportunities we hadn’t considered. Why spend time guessing at the unknowable? When we first started adding the 3,124 completely different US court we had no idea how many there were. Our technology at the time couldn’t handle many of them. Many were paid and we had no idea how to handle the expense or solve many of the problems that we knew about, let along the harder ones we discovered later. If we knew then what we knew now, we would never have done it. Most of the industry considered it to be “impossible” and a professional corporate entity could never start a project with so many unknowns. I think this is why we’ve been able to grow to have more coverage than all the major database combined in just 2 years. It’s a completely different attitude to the problems. I started when I was 23 and have probably read over 5,000 books. I started to fill the gaps while I had to wait for people to do things. People would come into my library and see the walls of books saying “It’s amazing you’ve had the time to read all this.”, “Not really”, I’d say, “It’s a monument to frustration. This represents all the time I’ve spent on hold or waiting for people to do something.” It’s been a good habit and I wish I’d started sooner. I’m not a big fan of formal education, if I want to learn something, I prefer to get a book on it. There’s a massive gap in the educational market because there’s no accreditation for auto-didacts. I change my mind often. Finding out you’re wrong is a good thing, it means you learned something and often saves you money. Law wise, I underestimated the reluctance of law firms to improve. It’s only been recently that law firm innovation officers explained that making their partners more efficient reduces hourly billing, so a more efficient solution simply won’t get used again. It’s a great shame because law lags other industries by decades because of it. The billable hour breeds inefficiency. Like Milan (who interviewed Toby on behalf of The Legal Forecast), Toby is a big fan of Tim Ferriss, the prolific US author, entrepreneur and “life-hacker”. Toby, what is your background? I’ve had what’s politely called a “portfolio career”. This means I’m decent at quite a few things, but expert at nothing. I know more about tech than most lawyers and more about law than most technical people. Throw in a lot of entrepreneurial ventures and the kind of mind that always asks “Why not?”. I came up with a question that’s now obvious and much copied – “How often do lawyers win?”. At the time it was heretical. Please tell us about your time at the University of Southern Queensland! When I decided to go to law school (around the time I was 40), I decided I didn’t want to take 3 years doing it. I did a lot of research into how to pass a course with the minimum amount of effort. Then enrolled in 5 schools and took the classes concurrently. I passed 3 years of law school in a year with only 90 days of study. I got dropped from a course at Open University in the UK because an admin decided my workload was too high(despite my protestations that I’d already finished). I’d run out of Universities in the UK that let me take individual course, so started looking further afield. University of South Queensland were flexible and good to deal with, so I did e-law there. After all that effort, I couldn’t combine any credits, so had to do it all over again…. I’ve basically done law school twice. Specifically, how did you come to be the Co-Founder and Chief Innovation Officer of a legal analytics company that deploys data mining and analysis to determine individual lawyer win rates before judges? I got through law school without using LexisNexis or any of the citation systems. I’d look up a case in Wikipedia and if it wasn’t in there, it wasn’t an important case, so I wouldn’t bother learning it. I imagined these were massive systems that had “all” cases in them. I was shocked to find out there’s practically nothing there and the courts weren’t linked up. After talking to some really unhelpful clerks of court that struggled to understand the concept of the “public” record(I later found out that many courthouse staff have lucrative sidelines selling court data to structured settlement funds, private investigators, etc), I decided the best way to proceed was simply to scrape the courthouse website. We scraped 1, then 2, then a few, then re-built the system from scratch probably 4-5 times to allow it to scale to thousands of courts rapidly. Court website scraping is standard industry practice that most legal information providers do, it’s just really hard to do at scale and normalize the data. We cracked that nut and left everyone else in our wake. Currently we’re downloading around 8,000 cases an hour from all round the globe. That’s bigger than many analytics firm’s entire databases. When we got the data, I wrote some algorithms to assign winners and losers, then let the system run. The results blew our minds. Let’s just say justice isn’t blind. What does a Chief Innovation Officer do? When Guy and I started Premonition I told him the company would be worth more if he was CEO. He’s an amazing businessman who’s been tremendously successful in a number of different industries. The fact that none of us came from law didn’t deter us, In many ways it’s been an advantage, but I think it probably took us a year more than it should for people to take us seriously. The other day a legal analytics CEO told us his standard counter to people asking about Premonition is that it’s all smoke and mirrors. We offered him a demo and he hasn’t returned our calls since. There’re still people that don’t want to believe, but data speaks for itself. I like to come up with new ideas and turn them into reality, Guy is the expert on the business side, so I focus on the tech. Chief Innovation Officer reflects this, I think. In the future as we mature, I’d like to do innovation full time. For those of us who don’t know, what exactly is “big data”, “data mining” and “data analytics”? What are the ramifications for the legal sector? In law many of the Emperors have no clothes. Big data brings transparency to an industry that’s traditionally had little. Kings will fall, heroes will rise. Nothing will ever be the same again. Neil deGrasse Tyson said “Science is true whether you believe in it or not.” It’s the same for legal data. You may not like it, but it’s here. There are huge opportunities for the first movers because law firms are very difficult to restructure due to all the industry restrictive practices. Those that bury their heads in the sand will wake up finding their clients have deserted them and they can’t afford to feed a hundred litigators “sitting on the bench” with no work to keep them busy. While a boutique firm with phenomenal litigators can now land major accounts because they have the stats to back them up and General Counsel can’t risk low stats of their own by giving “work to their mates”. Do Premonition’s findings suggest that some advocates perform better in front of some judges? If so, are you able to give us an insight into what this advantage is attributable to? Absolutely. We’ve found the lawyer/judge pairing is worth 30.7% of the average case outcome. Even our detractors concede that some lawyers are better than others. There are numerous reasons why this might be the case – skill in advocacy, ability to construct a strong argument in law or equity, personality, good looks, who really knows? We try not to theorize as we’re so often wrong if we guess. We do know that these advantages are real. Whether they are fair is debatable. Why they exist?, we’ll leave for others to speculate on. Some, particularly the public, may find it disturbing that lawyer/ judge pairings alter the outcome of a case – should they be disturbed? Eventually, I believe every great change in law will come from transparency. The Heisenberg Observer Theory states that people behave themselves better when they know they’re being watched. As Peter Diamandis says “Most evil is done in the dark.” I’m not saying that the profession is evil, but its incentives are not well aligned with clients. There are few areas that are not improved by transparency and measurement. Do you think publishing results like this will negatively affect public confidence in the courts and if so what do think the solution to that may be? In the short term this is quite likely. Many lay people say “I knew it”, or give me a knowing smile when I tell them that we know which lawyers win before which judges. Many general counsel, people who pick lawyers for a living, have told me they’re surprised the personality effect is only 30%. In the long term, I believe that transparency and measurement will increase trust in the courts. Finding your judge decides in line with his peers, doesn’t play favorites and is rarely over-ruled on appeal would be a comforting thing for litigants to know and believe. Further, does it risk creating a kind of cycle, where clients / solicitors continually select ‘pairings’ with good results and thereby reinforce biases that might exist? This is a very valid point. I believe it is likely to lead to The Matthew Effect – “He that hath shall be given more”. The flip side is not over paying for poor performing lawyers. After a while market forces begin to take hold though. The top guy isn’t available because he’s too busy, or takes on too much work, so his win rate suffers. This is where other lawyers compete on factors such as case duration and cost. Flat fee litigation, or flat fee per case phase, first filings, discovery, depositions, etc? You’ll see that when the market becomes transparent and competitive. Studies have shown that clients are willing to pay 20% more for flat fee services due to higher certainty on costs. Are lawyers really that incapable of figuring out how long a typical lawsuit will take? I think not. We read an article about Premonition that described a study which “revealed that the correlation between pricing and performance is weak, and that a law firm’s choice of barrister was 38% worse than random”. Are you able to unpack this for us? How was the figure of “38%” arrived at? 38% worse than random seems nuts! I agree, 38% worse than random is totally nuts. What is the future for Premonition in Australia? We’ve added the Australian Courts and are interested in finding people to partner with there. We’re firm believers in strong partnerships and having people with the right contacts in the local markets. The insurance companies drive litigation, so we like to find people with strong relationships with insurance claims managers and general counsel. Will you be hiring and how do people apply? We’re certainly looking for partners. Most of the people we wind up doing business with were “fans” who reached out and asked how we could work together. Finally, what is your “legal forecast” i.e. what will the legal sector look like in 10 – 20 years from now? I think we’ll see business as usual for about 4-6 years. Then there will be a grand shifting of major litigation accounts from firms with established GC/managing partner relationships to smaller firms with proven performers. Brand will suddenly be worthless. Law firms are difficult to restructure and not noted for their agility. Many will disappear. With stats driving litigator selection results, cost and efficiency will suddenly become vital. The first firms to roll out automated contracts, e-discovery types solutions to all areas of their operations, etc will be able to swipe accounts from laggards. This doesn’t happen now, because the legal market is opaque and inefficient. But that day will come. See Part 2 of our interview with Toby here. Cliff Kuehn is a California-licensed attorney and registered European Trade Mark Attorney. He is the director of Kuehn Law, a virtual law firm based in California, and provides branding, media, internet and intellectual property law assistance in the U.S. and EU, especially for web or mobile-focused companies. Cliff has shared his experience relating to starting up and successfully operating Kuehn Law whilst living in Berlin. What has been your experience in setting up a digital law practice and what has been the most rewarding aspect of this process? My experience is one I accidentally fell into, but can be reproduced by anyone intentionally. In a nutshell, the challenge in setting up a digital law practice is sorting through the massive amounts of information available on the subject. Whether it’s selecting an email service, digital signature SAAS, or learning about data security, there’s a mountain of information to sift through before arriving at a conclusion. Like the practice of law, knowing how to filter information and make decisions was key, because it’s impossible to review all the helpful information. Know what you want to achieve in a practice first, and that helps you know which tools fit your practice best. That being said, there are wonderful digital tools available to anyone wanting to start a digital law practice, which I define as a law practice independent of a fixed office location. Are there any disadvantages with operating a digital law practice? I think communications are difficult if your practice area tends to benefit from human contact. To illustrate, I focus on trademark law and serve business clients, 50% of which are at the startup stage. My clients tend to like a “light touch” relationship when it comes to communication, meaning efficient phone calls or sometimes managing the relationship completely by email. Of course some clients like to be more involved in the process, and I like working closely with clients too, so I have face-to-face meetings at times but generally it’s not crucial. On the other hand, if you work in criminal or family law, the quality of interpersonal communication more significantly affects the outcome of sales, negotiation strategy, trust, and trial results. In these types of practice areas, I assume attorneys benefit from more direct communication in a traditional office setting. The recent and rapid increase in digital technologies has created dynamic legal issues – have you faced any issues with digitalised legal practice? Personally no. There are some jurisdictions (both states in the U.S. and other countries) which require attorneys to have a fixed, brick and mortar location. I don’t see the necessity of this and am fortunate to be able to operate from California, a jurisdiction that doesn’t have this requirement. I can foresee that as my practice grows, data security/encryption measures which exceed normal standards will be demanded by larger clients (this seems to be the case for larger patent clients). Does social media have a role in the application of justice? Social media is a fantastic tool for drawing attention to issues which might not have gotten as much attention a decade, whether it’s the calorie count of a celebrity’s breakfast or a more serious issue such as corruption of government leadership. I personally credit social media for activating a whirlwind of awareness in the United States among members of all political stripes regarding use of force among police officers. Social media can bring attention to issues of justice, and further activate people to become engaged in the legislative process. Should Law Schools focus on future-proofing legal skills with an increased focus on information technology skills? Absolutely. Our daily lives are becoming more soaked with information technology and attorneys need to understand technology as they understand human nature itself. Imagine trying to prosecute a case with evidence gained by using a fake social media account to befriend the defendant and subsequently extract a confession. Is this evidence acceptable? What if the police demand a social media company to release location data for communications made by the defendant? What would be the one piece of advice you would give to a law student commencing their first year of law school in 2017? Dive into an area of the law that interests you (instead of the area calculated to be “safe” or “profitable”). If you want to get ahead, start thinking about the technologies that will change the world in the upcoming years: self-driving cars, virtual reality, limitless speed and bandwidth for wireless data, etc. Imagine if you were a law student in 1999 and dove into internet issues and the law; where would you be now and how interesting would your work be? Technology is fast. Law is slow. Take advantage of that.